Using the DCU and simple programs, you can control motors, lamps, LEDs, buzzers, stepper motors, and other DC devices. You can even develop more elaborate projects, such as robots or automated scientific apparatus. The most exciting DCU projects involve combining sensors with control. The Digital Control Unit is a small box with a short cable that plugs into a digital connector on the LabPro or CBL. An external power supply is required (not included). Most people will use the Vernier AC Adapter, but batteries or other power supplies can be used. Inside the DCU are visible LEDs that indicate the status of the six output lines. A socket is provided for connecting electronic devices that you build. A cable with bare wires on one end is provided for your first projects. 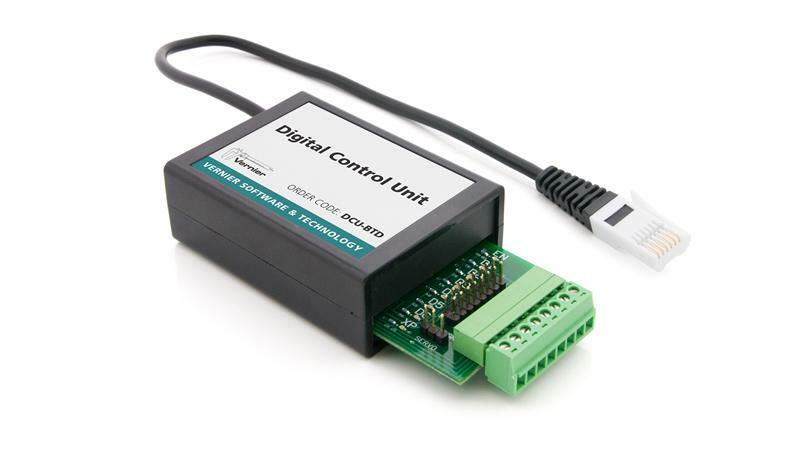 The Digital Control Unit requires a compatible interface and software to collect data. Interface and software sold separately.